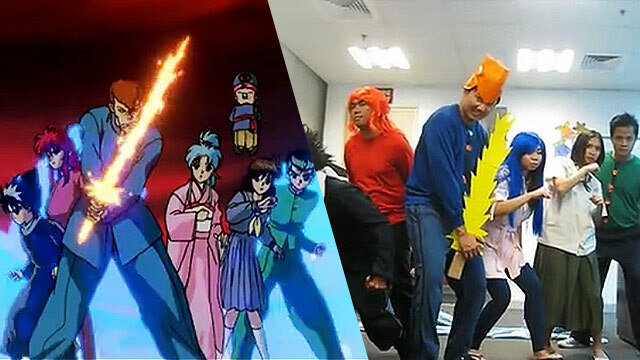 This low-budget but earnest remake of the iconic anime will make you want to watch an episode again! We won't hide it: Ghost Fighter was a big part of the childhood of many Filipinos growing up in the '90s. During its first run on Philippine television (it was on IBC 13, if memory serves us right) it was a weekly affair that school kids simply MUST NOT miss. Miss it, and you won't be able to join in the classroom conversations the week after. These kids, us included, eventually grew up. But that fondness for the series never really left many of us, hasn't it? A video featuring an improvised, low-budget recreation of the series' opening sequence proves it. Uploaded way back in November 2012 by Facebook user Ella Bundac-Alagan, the video features a group of employees in Ghost Fighter costumes doing a serious scene-by-scene rendition of the sequence. Using makeshift cosplay implements and low-tech special effects, the video is done in earnest and with real love for the series. It just goes to show you that fan appreciation need not be flashy and expensive at all. Since we're on the topic already, why don't we share one of our favorite Vincent (Hiei for the purists) fights from the series?